I realize I haven’t taken time to share on my readings since last Great Lent. 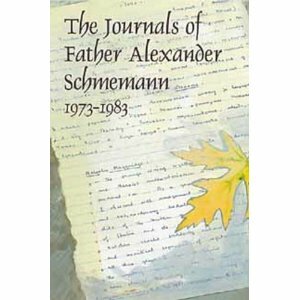 Among other things, I am now in the process of reading Schmemann’s Journals. This great man impresses me here by his self-honesty and humility. It is also quite reassuring to see this great man dealing with lots of inner struggles. It is besides beautiful to see how in his 50s, he starts seeing some kind of synthesis in his life. I guess this is the beauty that comes with age. A strong faith attenuates the intensity of problems. because God is not part of the world. but life with God, joyful and full. This is God’s salvation of the world. It is fulfilled every time that we believe. but the presence in the world of a saved world. transforming it into a relationship with God. but in being content with what there is. to anything in the world. and transform each day into joy.